Find an Oktoberfest Event Near You! The months of September and October are quite colorful—more than just Fall leaves, there are also plenty of Oompah bands, polka dancers and steins raised in good cheer. Oktoberfest has arrived, and there are plenty of events close to travel nursing and therapy jobs you won’t want to miss. For travel health professionals East of Seattle: For R.N.s and therapists living in Washington state, it doesn’t get much prettier than Leavenworth, WA. Nestled in the foothills of the Cascade Mountains, Oktoberfest enthusiasts will love this giant Bavarian party held October 4 and 5th: Click the Leavenworth Oktoberfest link for details! Ongoing Oktoberfest Fun near Wisconsin: In Glendale, just 10 miles north of Milwaukee, you’ll find Bavarian food and fun in Heidelberg Park, every Saturday and Sunday night through the month of September. Toast to October in the Mountainside German Hamlet of Helen, Georgia: Travel nurses anywhere near this Appalachia town, will have to rush over and see what all the fuss has been about every autumn since the 1960’s. 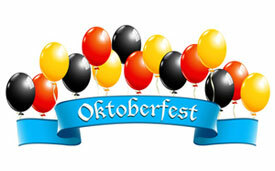 September 19 through October 27th, there will be daily Oktoberfest celebrations. Colorado nurses and therapists won’t want to miss the Denver Oktoberfest! : Now in its 44th year, over 300,000 revelers are expected to celebrate Oktoberfest on Larimer Street. Expect lots of live entertainment and great food, September 27-29 and October 4-6th. Healthcare professionals in the South Florida Area are Going to Love Lantana in October: Click on this amazing Oktoberfest site to get the details! Lantana is a hop, skip and jump from the West Palm Beaches and close to Greater Ft. Lauderdale and Miami. Food and fun will be held October 11-1th and pick up again October 18 through the 20th. Willkommen, to the Best Travel Nursing Resources in America! So there you have it, a national sampling of fun events for healthcare professionals working across the country! Be sure to “like” us on Facebook for the daily buzz on happening spots, Healthy Careers information, nursing and therapy career trends. Alvererzane! Previous Previous post: Are You a Travel Nurse Who Caught the Cooking Bug? Next Next post: Travel Nursing Adventures Include the Local Farmers Market!